Gigi Macintosh realized the task confronting her after leaving the coaching staff at Mt. Zion High School for Morton when one of her early softball teams stumbled badly. "But we went from 10-40 to 40-10," she recalls, a won-loss shift that points out dramatically the job she has done in her 11 years at Morton. Last spring her Potter softball team went 35-4 and finished third in the Class AA state finals, following up a 36-4 year the season before that earned Morton a second place state finish. 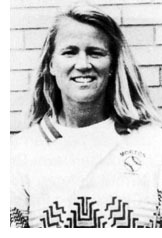 MacIntosh, who began her sports career as a student at Mt. Zion, went on to play softball, field hockey and swam at Eastern Illinois University. She then coached basketball and volleyball at Wilmington High School for one year and spent two years at Mt. Zion as softball and basketball coach before moving to Morton where she has forged a softball power. In 11 seasons she is 240-115, despite a few bad early seasons, and has won three consecutive Mid-Illini conference titles. 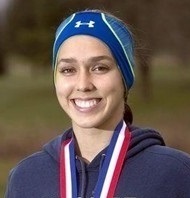 Gilbert repeated as the IHSA 2A state track champion in the 3,200 meters in the spring, clocking a school-record 10:34.13, and added a third-place medal in the 1,600 meters. The Peoria Notre Dame senior went on to defend her IHSA 2A state cross country championship this past fall. She also finished third at the Midwest Regionals, then earned All-America honors by finishing runner-up at the Foot Locker National Championship in San Diego. She completed the year by earning one of six positions for Team USA at the Junior Women’s International Cross Country Meet in Scotland.